Can the Skiff save the magazine industry? There has been quite a bit of talk about Hearst’s Skiff ereader and we got a hands-on last night before the show closed. 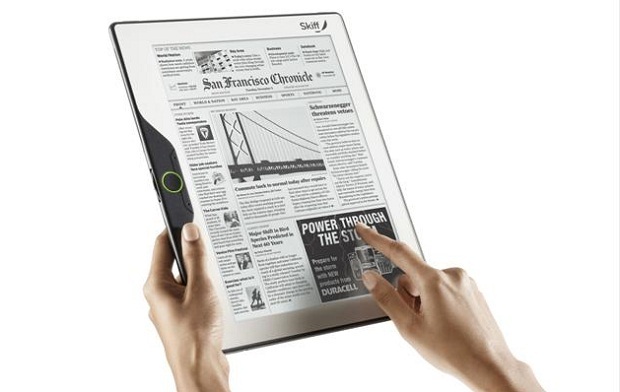 The device is about as big as a Kindle DX (11.5-inch display and a very thin bezel) but quite thin (.25-inches). They use a metal board spun-coated with e-ink instead of a glass sheet for the screen, which will definitely prevent the heartbreak of shattered ereaders for the next generation of readers. It uses Sprint’s 3G network. However, I doubt seriously you or I will ever add a Skiff device to our arsenals this year or any year. Here’s why. Skiff isn’t in this game to make hardware. They’re in it to save their industry from imminent demise. Magazines, as they exist now, are expensive artifacts of an industrial process that has been refined over the past century. They are eye-catching pieces of typographic art and they contain some of the best writing of any generation in a package that appears on a monthly basis and is sold or mailed to readers in paper format. But – and here’s where Skiff comes in – there is no perceived value in print magazines anymore. They are expensive to produce and circulation is falling drastically, resulting in a panic in the industry. The solution? Subsidized ereaders and reading services that will keep the subscription model from failing. The Skiff is the first of these efforts and, if first mover advantage remains true, they may be the winner. Think of the Skiff, then, as something like a Roku box for magazines. The Skiff isn’t even supposed to be for books. The software is focused on the representation of magazines in their native format, complete with all of the design frou-frou publishers love. That said, the physical device itself is secondary to the goal of moving paid subscribers to a different delivery system as quickly and easily as possible. The Roku box, like the Skiff, is a proof of concept and a device for early adopters. The real value in the Skiff proposition is in the other color devices that exist, namely other ereaders (even, potentially, Kindle et al) cellphones, laptops, and, possibly, tablets. Skiff’s software is specially designed to work almost anywhere, with or without a touchscreen, and, like Netflix on the XBox, for example, it doesn’t need a dedicated, house manufactured physical product to compete. The Skiff is a device designed to make nervous publishers less nervous. We all know ereaders are the future but it has taken publishers a few years to get on board. Think of the Skiff as Hulu or, frighteningly, Joost. It is a way through the vague and backward business model of an entrenched industry and, if it fails, could mean the end of magazines as we know them. Here’s hoping it works.